Medieval Europe has been devastated by the Thirty Years War and the plague. Krabat (David Kross – The Reader, War Horse), a fourteen year old orphan lives on the margins of society, travelling from village to village to beg out a meagre existence. Life is relentlessly grim, until Krabat's dreams direct him to a remote mill. The master of the mill keeper offers him the chance to stay, and Krabat readily accepts only to find himself drawn into a world of magic and dark arts. His new found powers are intoxicating but fellow apprentice Tonda (Daniel Bruhl – Inglorious Basterds, The Edukators) warns him to leave. As dark secrets are revealed, the mood becomes menacing and Krabat knows escape is the only answer. Only by enlisting the help of a girl unaware of the secrets of the dark mill can he hope to elude the forces of Evil...but is it too late? Can the power of love alone be enough to eradicate the power of black magic? Based on the best-selling novel by Otfried Preussler and described by Screen International as "Riveting Faustian tale of teenage boys seduced by the lure of black magic that goes darker than even Harry Potter dares," Krabat and the Legend of the Satanic Mill is an impeccably crafted fantasy set in a stunning Alpine backdrop that rivals Peter Jackson's Lord of the Rings. With the addition of spectacular SFX wizardry, Krabat is a soul-stirring adventure that is being promoted as ideal viewing for Harry Potter fans eager to delve into a fantastical world before the cinema release of The Deathly Hallows: Part II. 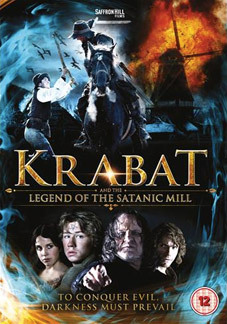 Krabat and the Legend of the Satanic Mill will be released on UK DVD on 8th August 2011 by Saffron Hill Films at the RRP of £19.99. The only extra feature is a behind-the-scenes featurette.